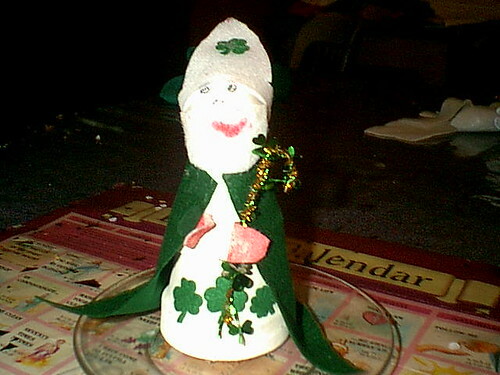 I wanted to do something different for a craft this time, so I chose to make a St. Patrick's Day Center piece based on the craft at The St. Nicholas Center. I figured that at least as far as crafts go, exchanging one bishop for another shouldn't be too tough! We followed the directions except we opted not to pain the face. We also exchanged red felt for green felt. We put a shamprock on the bishop's hat with a cross in the center, and green press-on shamrocks on the front of the vestment. 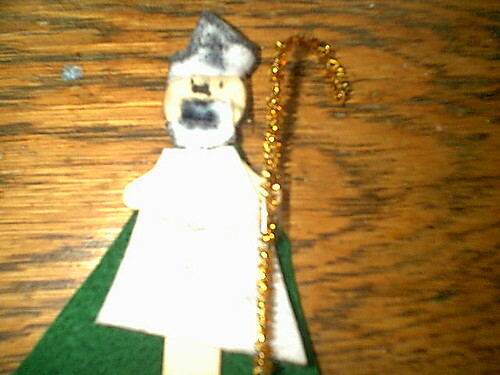 I also have a shamrock vine climbing his shepherd's staff. St. Patrick chased all of the snakes off of the Isle of Ireland. 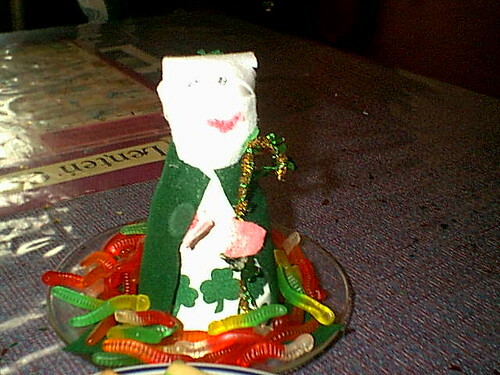 Our St. Patrick chased four packages of gummy worms representing snakes off of the plate and into the mouths of my children! 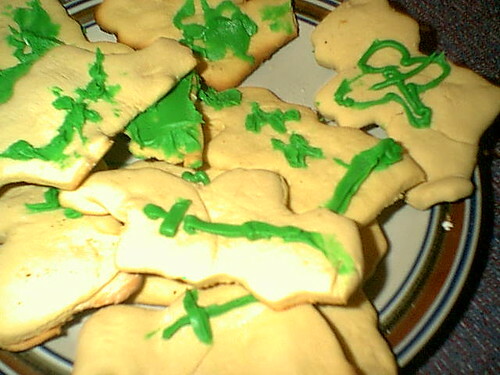 I ordered the special cookie cutter in the shape of Ireland after reading about it on the Cottage Blessing Blog. It was so funny to watch the kids and Mr. Pete look at the cutter and wonder, "what is it?!" 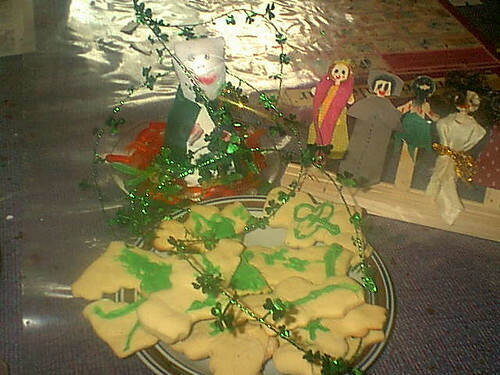 The cookies weren't very easy to cut out either!! But what they lacked in shape, they made up for in frosting! Izzy decorated. Frankly, I had to ask her what some of the markings were, but she tells me she made crosses, rosaries, shamrocks, hearts and snakes! If you look at them just right, and maybe squint a little, you can see them too! 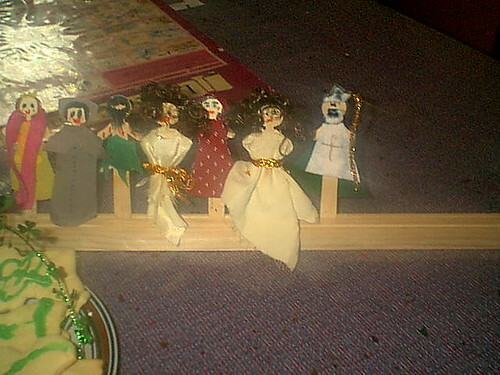 Izzy also wanted to make a St. Patrick out of our wooden spoon figures for our collection. She did this one all by herself! Speaking of spoon saints, here are the Sts. 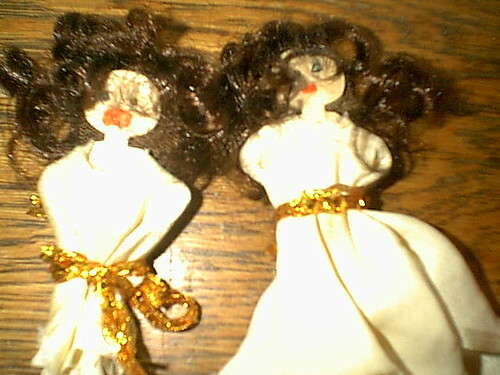 Perpetua and Felicity that we made for their feast days. We experimented with doll hair. It was fun. If you look carefully, one of our dolls is pregnant. That's how you can tell Perpetua from Felicity. Izzy taped some little balls under her dress to make her look pregnant. So here are all the spoon saints we have so far! Mr. Pete made this wooden rack for us to keep them all standing up.